Currency: ONLY USDJPY in the trial version. The setting are dealt with internally, simply place the EA on the appropriate symbol. See comments section for full backtest. 7. Price changes are at the discretion of the business owner. The price which you pay today maybe significantly less than future price because of the laws of supply and demand and the market's price mechanism; conversely, future price maybe less than what you pay today. Unfortunately, this is how free-markets function. 8. 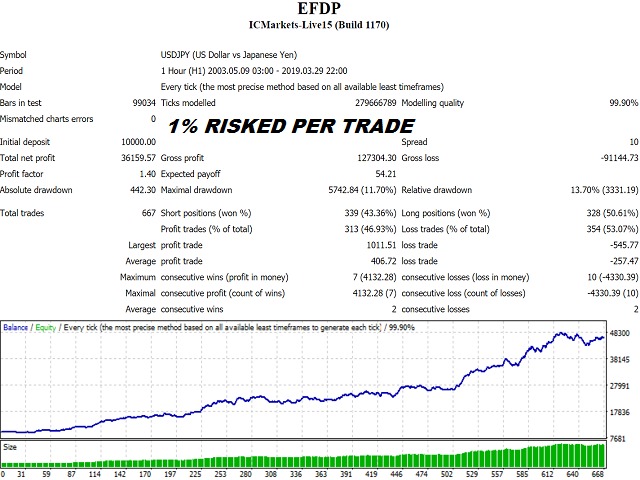 I advise you to use a fast MQL5.com vps and an ECN broker; put the algo' to work and leave it for a reasonable amount of time, say a month to a quarter, then review. If a trader is stuck to his terminal minute by minute watching and second guessing the strategy; in my opinion, this completely defeats the reason of automated trading in the first place. In short, give the strategy time to do its job.